On May 13, 2012, a grand Buddha Bathing Ceremony, jointly organized by Tzu Chi KL/Selangor and Klang, was held at Kuala Lumpur Football Stadium, Cheras, to celebrate Buddha's Day/Mother's Day/Tzu Chi's 46th Anniversary. More than 7,500 people formed a magnificent totem design of Bodhi Leaf-Lotus Flower-TC46, to signify Buddhism leading everyone towards the Bodhi Path. The grand Buddha Bathing Ceremony held on May 13, 2012, at Kuala Lumpur Football Stadium, Cheras, was jointly organized by Tzu Chi KL/Selangor and Klang to celebrate Buddha's Day/Mother's Day/Tzu Chi's 46th Anniversary. More than 7,500 people formed a magnificent totem design of the Bodhi Leaf-Lotus Flower-TC46, to signify Buddhism leading everyone towards the Bodhi Path (the Path to Awakening). Eighty-one Dharma Masters from Theravada, Mahayana and Vajrayana Schools of Buddhism played the key role of leading devotees in praising the Universal Awakened One (Lord Buddha Sakyamuni), Bodhisattvas and the dissemination of the Great Compassionate Buddhism across the globe. 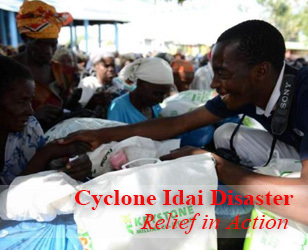 This year's grand celebration had two themes to highlight these campaigns: "Bamboo Coin Bank Era" (using petty savings to help the needy) and the "Do not eat to your heart's content; leave a little for charity". Tzu Chi KL/Selangor and Klang had gathered more than 7,500 totem performers to zealously observe vegetarian meals for 108 days before the grand occasion. The Buddhist totem design of Bodhi Leaf-Lotus Flower-TC46 signified the Dharma leading everyone towards the Bodhi Path, thus creating a Pureland in this Saha World. 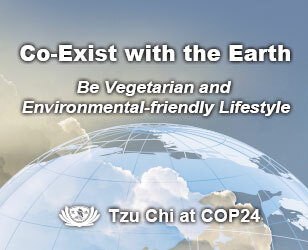 In celebrating its 46th Anniversary, Tzu Chi emphasized the "simple vegetarian life" for everyone in a concerted effort to protect our planet Earth from further destruction. The celebration commenced at 7.30 am - 8.30 am with the formation of the Buddhist totem design by more than 7,500 people, followed by Buddha Bathing Ceremony by all participants from 9.00 am - 11.00 am. The handing back of the Bamboo Coin Banks were around 7,500 pieces. It is hoped that through this Buddha Bathing Mass Blessing, all participants could be cleansed of delusions and be enlightened by the Buddha's great compassion. Besides being reminded that we all owe immeasurable gratitude to the Buddha, our parents and all sentient beings, it is also hoped that through sincere prayers, natural catastrophes can be averted to a great extent while our society becomes a much more peaceful and safe place to live in. "I love you, Mum! Thanks for everything!" exclaimed Lin Zi Yu as she held her mother's hand tightly when accompanying her to the Buddha Bathing Mass Blessing ceremony. After graduating from music school, she had wanted to study in a school of higher learning to further her music career. But, she did not fulfill this ambition because she did not want to burden her family. Earlier this year, Madam Xie sustained a serious brain damage in an accident. When she was bedridden in Sungai Buloh Hospital, Zi Yu had to travel extensively to take care of her. Wishing for her mum's swift recovery, Zi Yu brought her mother to the Buddha Bathing ceremony this year to participate in the Mass Blessing. Madam Xie missed the prostrating pilgrimage ceremony last month because she was not feeling well. This time round, she attended the Buddha Bathing ceremony in Cheras, accompanied by Zi Yu. The latter had expressed that she will be more respectful to her mother by showing more concern for her. This year, there was a "Great Love Buddha Bathing Zone" in the spectators' stand, solemnly enhanced by four lazurite Buddha statues, compassionately welcoming the disabled people to the special ceremony. Forty-five year old Hong Pei-ling's mother-in-law is physically-disabled and could not speak after a stroke three years ago. On this occasion Pei-ling accompanied her to the Great Love Zone. She brought her mother-in-law along to participate in the Buddha Bathing Ceremony so that she could look after her, celebrate Mother's Day with her, as well as, expose her to the righteous forces of Buddhism. Granny Su Mei-jin used to attend the Buddha Bathing Ceremony in Muar when she was living in Segamat. Last year, she moved to Kuala Lumpur. She learnt from Da Ai TV that the Buddha Bathing ceremony in Kuala Lumpur used to be on a larger scale, she had hoped to attend the Ceremony. Her wish came through, accompanied by her son Chen Sheng-hong and her daughter, she came for the Mass Blessing. Yu Guo-en, aged 29, who was born with muscular dystrophy, came by taxi to participate in the Mass Blessing ceremony with her mother, Lie You-lian, who was limping from a right foot injury due to an accident years ago. This was the first time they came for the Buddha Bathing. At the Great Love Buddha Bathing Zone, this caring mother uttered these touching words while paying homage to the Lazurite Buddha: "I wish my son will recover fast." Under his mother's tender care for the past decades, Guo-en was full of gratitude for her and spoke of the wishes he made that day: "Apart from wishing that all calamities and sufferings in this world could be averted, I would also like to wish my mother the best of health!" Tears began to well in his eyes as he hugged his mother tightly. Pan Mei-jun, Special Assistant to the Executive Director of Bonia Corporation Bhd, remarked in excitement: "This is the most unique and solemn Buddha Bathing Mass Blessing ceremony in which we can thoroughly cleanse our minds and souls!" "This Bamboo Coin Bank contains not only some donations but also my compassion and ambition to help the needy," said Liu Yuan-yong, Computer Specialist of Bonia Corporation Bhd. Liu added, "My Mother's Day present for mum today is to wish her good health and longevity." From the spectators' stand, Madam Chen Li-teng felt a sense of tranquility and solemnity during the Mass Blessing ceremony. She was very touched to see everyone so fervently paying homage to the Buddha. She was glad to take part in this grand ceremony and learnt a little about Buddhism, doing charity and being respectful to her parents. Despite his busy schedules, Tan Sri Lee Kim Yew, a Buddhist, attended this Buddha Bathing Mass Blessing Ceremony, his second to-date. He had to drive from Perlis to reach his home in KL at five that morning. 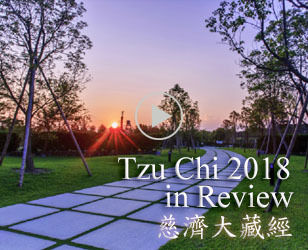 He believes that the "three-in-one" (Buddha's Day-Mother's Day-Tzu Chi's Day) celebration will help us to learn more about Buddhism, filial piety and respect towards the elderly. "First of all, I would like to thank Master Cheng Yen for creating this meaningful Mass Blessing Ceremony. As there are so many people participating in this solemn celebration, even if you are not a Buddhist, you would be amazed to discover the great motivating spiritual forces in this part of the Buddhist World." Tan Sri-lee's mother passed away earlier this year. Recollecting the precious moments while taking her out to the Buddha Bathing Ceremony last year, he said: "The Buddha Bathing Ceremony this year is very meaningful to me as my mother had passed away recently. So, I will ensure that my children take part in this Mass Blessing, which will offer them an opportunity to respect their mother." The Buddha Bathing Mass Blessing Ceremony came to a majestic end, amidst rousing well-wishes echoing far and wide for "Bathing the Buddha's feet, basking in the fragrance of flowers and auspicious blessings!"